everynothing wonderful: Apparently it is apple week! Ever hear of the phrase "as American as apple pie"? Of course you have. It's a funny, quirky little turn of phrase because pretty much nothing about apple pie is very much American at all. Apples are from somewhere in Asia, pie is pretty assuredly Roman in origin and well, there are about a billion variations on the singular recipe: Apple Pie. Apples went though their dark days in America - with prohibition roiling about, industrious imbibers crushing tart, inedible apples into the cloudy filmed drink we call "cider" gave apples a black eye for a bit. But, of course, marketing came to the rescue (and the 21st amendment), the Apple marketers touting the merits of "an apple a day" and so forth. Perhaps though, the apple is a perfect symbol of the American public at large. For the most part, but for a dwindling number (sadly) of Native Americans, most Americans can not call any part of the land that makes up the United States the homeland of their heritage. Recipes came from every area of the globe in the pockets, purses, and minds of generations that settled here - and so, like the at least 7,500 types of apples available, there are probably that many variations on recipes using apples that have come to be a part of the fabric of memories of American life. Apples seem to bring out the industrious nature of Americans - be that Johnny Appleseed* wandering about selling seeds and saplings to a rather large swath of the American public, or the cider makers thumbing their nose at prohibition, the horticulturalists at the University of Minnesota who have developed a huge number of new apple varieties, or the Cornell/New York State Experiment Station that maintains the world's largest collection of apple trees. Despite apples being used as a negative trope in such parables as the garden of Eden, I, personally, think apples bring out some of the best stuff in people - they highlight the ideal that people are, inherently good at heart and do actually care. They are a difficult plant to raise, for many reason, and demand patience, understanding, and attention. People like the now mythic Johnny Appleseed, cultivated their apples and relationships with care, passing on food for thought and the body. I made more apple sauce today. 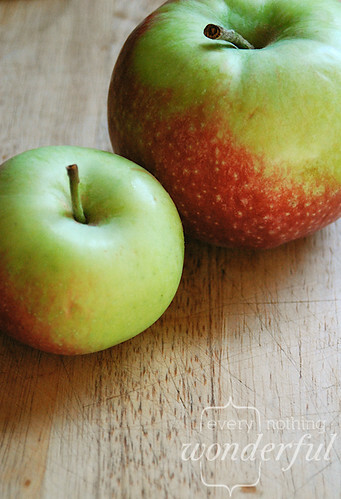 The apples I used came from two places about as pure as can be: ingenuity and charity. The ingenuity comes from a dedicated and hardworking group of neighbors who built and maintain a section of our neighborhood filled with a variety of fruits - berries, peaches, apples, grapes, etc. 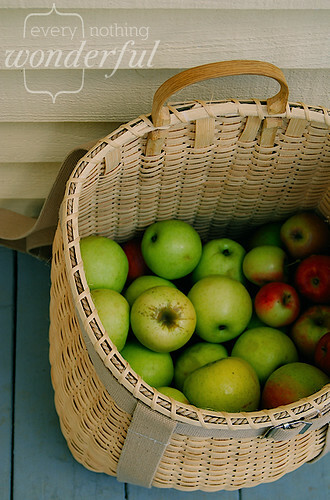 Neighbors are welcome to pick and enjoy fruit from this entirely practical landscaping scenario. I took the little one the other day and we selected a few apples form each of the different trees. It was here that I realized Eh might love the skin of an apple as much as I do – she picked her own fruit and held it tightly, first taking a big bite, then nibbling off the skin as fast as she could. When I made apple sauce I gave her a bit of skin and, indeed, she loved it! The charity comes from a local farmer. I went to the farmer's market today, despite only having five dollars left in my grocery envelope. Eh and I needed to get out and the weather is gorgeous. As I wandered about I noticed one of the sellers I like has started to have apples, and, though they have 15 varieties growing, only 3 were available. Having a stroller at a farmer's market means having a little more patience than some and being willing to take a backseat to those who are more able to plunk themselves at the front of the line. I waited. Not a big deal. I got a taste of a lovely variety I've never had, Zestar (bred to be an early apple). Not too long a wait and a man on the side, who was loading and moving the apples, asked if he could help me. I told him yes, that I wanted to make apple sauce for Eh, that I only had five dollars and that maybe a variety would work? He asked about one of the varieties in front on him in the large bushel ($18) and half bushel baskets ($12), and said that was what he would suggest. Of course I said sure and that I would take whatever I could get for the five dollars. 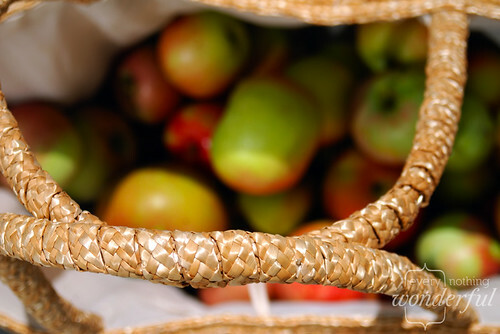 He looked at me, looked at Eh, and then pulled the bag full of apples from a half bushel and said "Here you go! "I asked if he was sure. He said yes, and winked at me and then said "Tell your neighbors. Do something good for someone". And I totally teared up (behind sunglasses, thank goodness). I always pay farmers who do such deeds back and I will, as always, give him the few extra bucks next time I go to the market, but I love the faith it restores in humanity when people are generous. As luck would have it I wandered the rest of the market just looking around and stumbled upon a mommy group whose goal is to be inclusive and service oriented. All of the activities are somehow service related – making blankets for those in need, doing crafts with veterans, soup kitchen work, etc – all of it includes the children of any age, teaching them that service is important and necessary. I joined. Do you think that's what the apple farmer meant? So, I guess that is what "as American as apple pie" is – something made up of many different origins, no right or wrong way to do it, with an eye towards industriousness and charity, highlighting the good of our diverse landscape. I ended up making apple sauce but I also made three "Apples in Their Nest" (from The Silver Spoon cookbook)- one for my incredibly understanding and wonderful husband, one for the gentleman in my neighborhood I had a meeting with tonight (who has given me some work), and one for my neighbor who helped me last week when I had a bit of a bump on the head. Now go do something good and be as American as apple pie about it! Don't forget to enter the giveway! 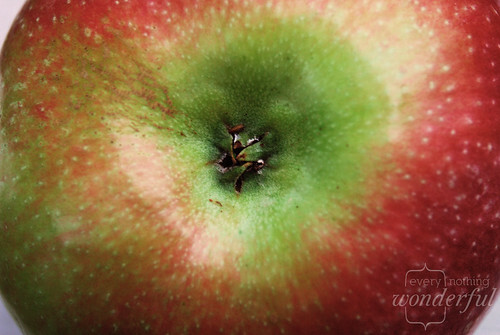 Apples are wonderful...I think I could eat an Apple Pie right now!